The earliest records we have today of what the Buddha said were written down several centuries after his death, and the body of teachings attributed to him continued to evolve in India for centuries afterward across a shifting cultural and political landscape. As one tradition within a diverse religious milieu that included even the Greek kingdoms of northwestern India, Buddhism had many opportunities to both influence and be influenced by competing schools of thought. Even within Buddhism, a proliferation of interpretive traditions produced a dynamic intellectual climate. 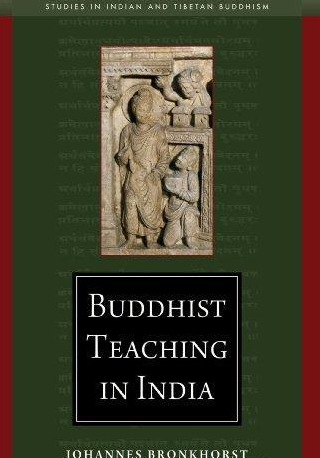 Johannes Bronkhorst here tracks the development of Buddhist teachings both within the larger Indian context and among Buddhism's many schools, shedding light on the sources and trajectory of such ideas as dharma theory, emptiness, the bodhisattva ideal, buddha nature, formal logic, and idealism. In these pages, we discover the roots of the doctrinal debates that have animated the Buddhist tradition up until the present day.